Show off your fish in a new light with this 3-gallon API Aquaview 360 aquarium kit from KollerCraft, which features multi-color LED lighting effects. Ideally sized and stylishly designed for desktops, this distinctive cylindrical tank provides 360-degree viewing and is a great match for the home, dorm room, or office. The Superclean 10 internal power filter cleans and purifies the tank at a rate of 45 gallons per hour. Why Get The Kollercraft API Aquaview 360 Aquarium Kit? The research-grade Bio-Chem Zorb 10 resin-carbon filter cartridge removes organic aquarium pollutant (including colors, odors, heavy metals, and toxic gases). This compact desktop tank provides the relaxing beauty of an aquarium but without the expense and maintenance hassle of a large aquarium. The full hood’s LED lighting offers four colors (blue, red, green and white), and the energy efficient LED lighting brightly illuminates the tank’s inhabitants without the cost and heat transference of other conventional aquarium lighting. Constructed of crystal clear, impact-resistant acrylic, this aquarium is as safe for your fish as glass aquariums, and its seamless fabrication eliminates the risk of leaks associated with aquariums that have glued seams. 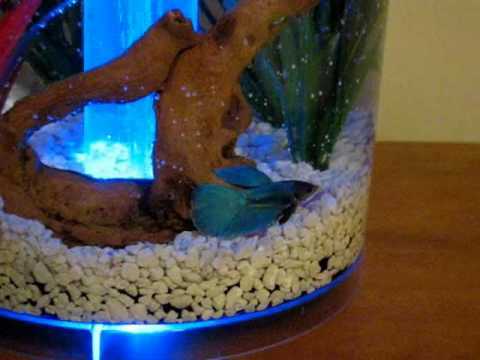 Easy to assemble, this aquarium also comes with fish food and water care starter products. In addition to its popular desktop aquariums, KollerCraft also offers TOM aquarium filters and accessories, and Repitat reptile habitats.